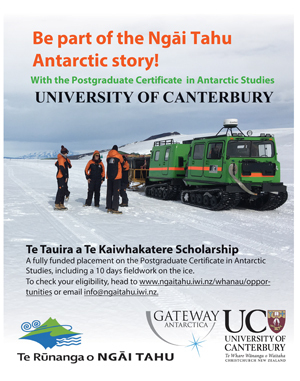 Be part of the Ngāi Tahu Antarctic story with the Postgraduate Certificate in Antarctic Studies. Te Tauira a Te Kaiwhakatere Scholarship provides a fully funded placement on the Postgraduate Certificate in Antarctic Studies (PCAS), offered by the University of Canterbury. It is supported by Te Rūnanga’s environment team, Te Ao Tūroa, in an effort to keep the oral histories of Ngāi Tahu exploration to Antarctica alive and to foster an awareness and interest in issues surrounding the continent. The scholarship name translates as ‘The Helmsman’s Apprentice’ and references the Ngāi Tahu pou whenua at Scott Base, which is named Navigator of the Heavens. This pou whenua captures the ancestral stories of waka helmsmen guiding Māori voyagers to the ice, using only the stars as a map. You don’t need to be a current student at the university to be eligible, but you do need to have completed a Bachelor degree at least and be a registered Ngāi Tahu member. We are keen to encourage applicants from a range of disciplines, so don’t be put off if you think you lack an environmental or science education background!